Cleveland, OH (January 2016) – Adalet is pleased to announce the completion of a new IECEx/ATEX Flameproof Control Panel Assembly Certification. This is a flexible certification which allows Adalet to supply custom, fully populated CE-marked enclosures which are Exd Zone-certified under an EQUIPMENT Certificate. This is a turn-key solution that eliminates the requirement for customers to resubmit enclosures having only a Component Certificate for 3rd-party testing. The control panel arrives from Adalet pre-certified and bearing the CE mark, thus saving customers considerable time and money. 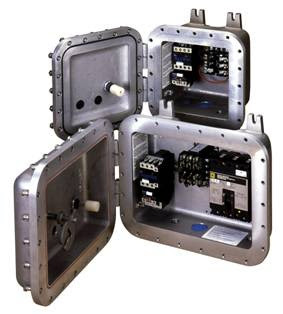 The Adalet IECEx/ATEX Flameproof Control Panel Assembly certificate allows for control operators, motor control components, and most other CE-marked electrical components to be installed inside any of Adalet’s broad line of certified flameproof enclosures. Bolted cover designs and threaded mouth enclosures are available. Adalet installs and wires all the control components and provides services for design review, certification compliance and required documentation.